MIAMI – Off Lease Only Miami is Growing! Stop by OffLeaseOnly Miami and check out the magnificent display of gorgeous used cars for sale. In anticipation of increased used car sales, Off Lease Only Miami is leasing a huge 7-acre lot on the perimeter of Opa Locka Airport for receiving and processing hundreds of incoming used cars and used trucks. About 400 used cars are parked on the new receiving lot which has a capacity to hold about 600 more used cars. 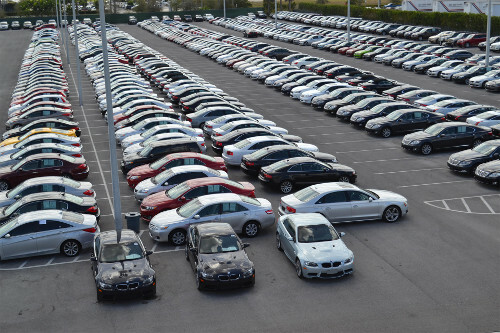 OffLeaseOnly used cars for sale are parked in endless rows outside OffLeaseOnly Miami. The sprawling OffLeaseOnly used car dealership at 5580 NW 145th Street already boasts acres and acres of some of the most desirable makes and models available, arranged in ramrod-straight rows that go on as far as the eye can see. The new gigantic storage lot guarantees expansion of the incredible OffLeaseOnly used car inventory in Miami. Visit Off Lease Only Miami and you will see an amazing sea of used cars that is only going to get bigger, because that’s the Off Lease Only way of doing business! Offering our customers thousands of used cars for sale all priced thousands below retail is what we are all about! New inventory was previously processed and stored in a lot near the Miami dealership’s entrance way. After that processing location was moved to the lot by the airport, about 300 large vans and SUVs were transferred to the front lot, freeing up 300 additional spaces for additional used cars for sale. The rearrangement makes it easier for customers to shop and offers more selection. OffLeaseOnly used cars await processing in the huge 7-acre OffLeaseOnly lot near Opa Locka Airport. With its beautifully-paved lots and long lines of carefully parked OffLeaseOnly used cars for sale, Off Lease Only Miami is one of the nicest car dealerships in the OffLeaseOnly chain. Managers expect to see enormous growth. Everyone is very excited. The Off Lease Only emphasis on top notch customer service is what keeps customers coming back, and satisfied customers tell their friends, family and co-workers about their OffLeaseOnly car buying experiences. Off Lease Only has satisfied customers in every state, 86+ countries and six continents. Off Lease Only will soon have huge new dealerships in Fort Lauderdale and Tampa, making it even more convenient for used car buyers in Broward County and Northwest Florida to shop for the used car of their dreams without having to travel. Customers flock to Off Lease Only to shop for used cars because every Off Lease Only dealership offers a gigantic selection of quality, low-mileage used cars with choices ranging from highline brands like Mercedes, BMW and Lexus to popular favorites like Chevrolet, Ford, Nissan, Mazda, Kia and Honda and Hyundai. 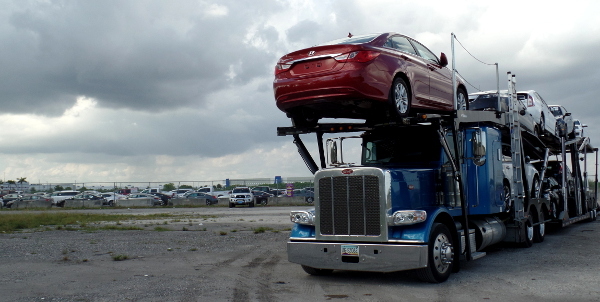 A truck transport loaded with OffLeaseOnly used cars waits to unload near the huge new storage lot by Opa Locka Airport. With more than 4,000 quality used cars online at www.offleaseonly.com, it’s never been a better time to buy a used car! Stop by any of our dealerships, in Lake Worth, Miami, Orlando or West Palm Beach, and find the perfect OffLeaseOnly used car at the perfect price! Off Lease Only can make your dreams come true for thousands less! Until our newest dealership in Fort Lauderdale opens, stop by one of our existing stores to check out our incredible used car inventory! Then drive home the perfect used car at the perfect price. ← Previous Story Rev Up the Holidays with an OffLeaseOnly Used Car! Next Story → OffLeaseOnly Reputation Shines!